I examine the issue of what we as B2B marketers mean by ‘demand generation’ and explore why there is so much disconnect around the current definition and scope of demand generation in my first post on the new Left Brain Marketing DemandGen (r)Evolution blog. So I put a stake in the sand with this post – asserting my belief that demand generation is a strategic activity; that it is in fact the charter of B2B marketing; and that it spans and should be defined in terms of our holistic interaction with buyers throughout their buying lifecycles. One, it looks at exactly why there is this disconnect among B2B marketers in the definition and scope of demand generation. Two, it examines ongoing evolution in our definition of demand generation. 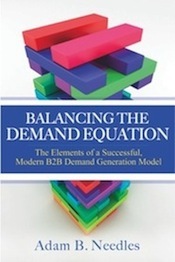 Three, it identifies what I believe are the three critical components of successful, modern B2B demand generation. Click here to read the full LBM DemandGen (r)Evolution post. The prevailing wisdom in marketing today is that achieving the greatest levels of performance requires true, closed-loop, customer-level insight into the effectiveness of marketing programs. If you can see a detailed, causal chain through the complete demand-generation process and correlate steps and interactions in that chain to account-level customer spending, you can then analyze how various marketing activities contribute to final results. Further, if you can analyze your marketing at such a granular level, you can tie spending to specific outcomes and can continuously tune your overall marketing formula at all levels. I’ve touched on this imperative in past blog posts. So no argument here. In fact, as a tenured marketer (and now as a team member at a marketing technology company), it’s exciting to look around and witness the rapid evolution in marketing technology that is moving us closer to this reality. It also goes without saying that in this environment, plenty is written about the drive for marketing accountability. Yet there is something subtle that gets missed and that I would argue should be the greater focus in the accountability dialogue. It is the inherent and holistic upside for marketers of having an accountability mindset – i.e., the positive transformation that results from embracing a new approach to marketing. I call it the ‘halo effect’ of marketing accountability.